The lack of sports anime seen on a seasonal basis is somewhat unsettling for me. Unsettling because the presence of sports anime should be more precedence since the majority of the sports anime I have seen so far (and it's not many) have all been great, and rarely disappointing. As someone who's not that big of a fan of watching sports in real life, there's something about the magic of the anime world that's able to create the action of watching sports in the form of anime appealing. Since volleyball is my favourite sport, naturally I was excited when Haikyuu was announced since it's premises surrounds volleyball. If you're an avid Kuroko no Basket fan and looking for something similar to quench your thirst then Haikyuu might be the a good match in terms of that. However unlike Kuroko no Basket, I find that Haikyuu was way more funnier and filled with actual laughs with each episode. The story follows first year high school students Shouyou Hinata and Tobio Kageyama and their lives on the volleyball team at Karasuno High. Shouyou comes from a middle school where he seems to be the only one skilled at volleyball whereas Tobio comes from a prestigious middle school with many skilled volleyball players. What's special about Shouyou is that he seems to be a self-absorbed narcissist when it comes to playing volleyball. Ultimately the story is about Shouyou finally getting the chance to play alongside many skilled team members and Tobio becoming less narcissistic when playing on the court. In terms of the design of the characters and the animation, nothing too special stands out for me. Since it's an anime based upon volleyball most of the times the characters are either in their school jerseys or sweats - which it fitting to the anime. Initially when I saw the character designs of Shouyou and Tobio I was a bit turned off because they did not appeal to me because Shouyou looked a bit weird to me and Tobio had crazy eyes haha. But don't let that stop you from enjoying this anime since it has a lot more to offer than what meets the eye. Unfortunately when it comes to the sound and OST in Haikyuu, nothing special pops out or can be deemed memorable; other aspects like the comedy seemed to overshadow this area of the anime. The set of OST are quite boring in my opinion however the sound fairs well - every sound is heard when it comes to the ball being smashed or squeaks made by the shoes on the gym floor, it's all there. Now lets talk about the characters. As mentioned previously we have Shouyou and Tobio, I will also talk briefly about another favourite character of mines named Yuu Nishinoya. So Shouyou is a ball of energy who loves to play volleyball, unfortunately for him during his middle school years he has never been surrounded by people who share the same love for the sport as he does. By the time he gets to high school he joins the volleyball team at Karasuno High as the decoy and harnesses his skills as a volleyball player. He encounters Tobio Kageyama who also joins the volleyball team at Karasuno High but as a setter. Now Tobio has this dark aura surrounding him and desire to win every game of volleyball no matter the cost, this includes treating other teammates like crap. As the anime continues we see Shouyou's bubbly personality rub off of Tobio and changes the dynamic of what Tobio's ideals of what teamwork is and what the actual definition of what teamwork is. And finally we have Yuu Nishinoya, he plays as the libero on the volleyball team. What I like about Yuu is that he and Shouyou have similar personalities; they're fully of energy, bubbly, a bit ditzy and very hilarious (not to mention his character design is so cool). After watching this anime I must say that I enjoyed it more than I thought I would. I was turned off by how the main characters looked but the overwhelming comedy and the way the characters were animated and brought to life won me over quickly by the first episode. Having said that I'm not a big fan of watching real life sports but there's something about sports in anime that makes it fun to watch. 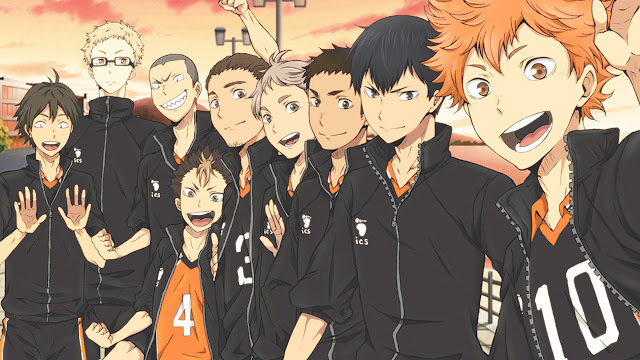 If you don't want to jump on the Kuroko no Basket bandwagon try watching Haikyuu as it is far less popular than Kuroko but far more entertaining. That's it for this review if you made it this far into reading, thanks! I appreciate the read and you won't have to wait long for my next one! Leave of comment below to tell me your thoughts on this anime or shoot me a tweet.